Due to the unique energy demands of strength and endurance based sports, athletes who participate in these activities have different carbohydrate requirements needed to fuel optimal performance. Aerobic endurance athletes and those who train for 60 minutes or more a day (think runners, cyclists, MMA fighters) should strive to consume 8-10 grams of carbohydrates per kilogram body weight daily to replenish glycogen levels. On the other hand, athletes who do not train aerobically for more than an hour each day (weight training, sprinting, football) should strive for 5-6 grams of carbohydrates per kilogram body weight daily. When and how many carbohydrates should I consume before, during, and after exercise? 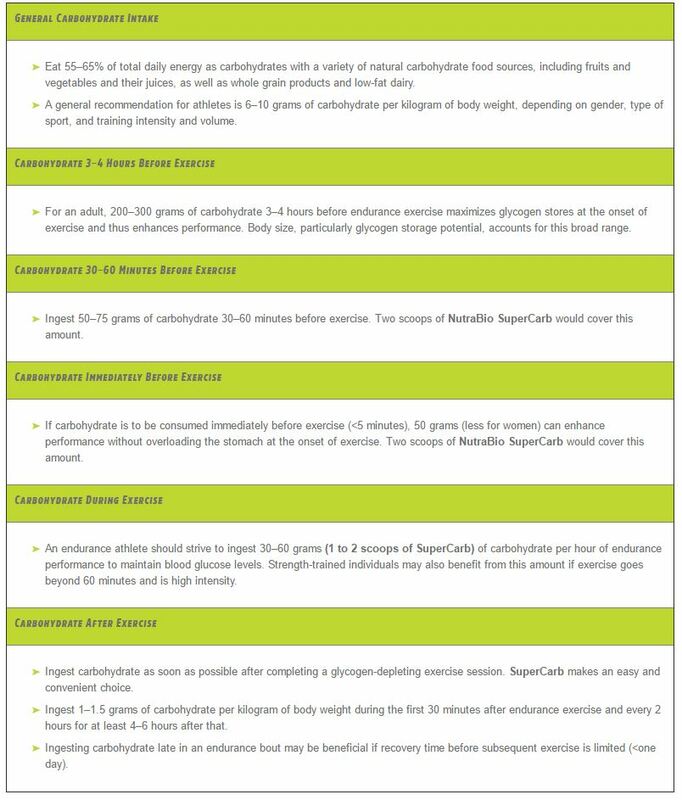 The following table outlines general recommendations for carbohydrate consumption before, during, and after exercise. However, athletes may need to experiment with different protocols (timing, types, & amounts) to produce individual optimal performance. Carbohydrates have been cast in a negative light the past few years with so-called experts stating they cause weight gain, excess body fat, adverse blood lipid profiles, and a host of other problems that can wreak havoc on our health (all of which are simply not true). However, what these experts fail to tell you are that carbohydrates are the preferred source of fuel during high intensity, anaerobic exercises, such as sprinting or weight lifting. Adequate carbohydrate consumption, broken down into glucose in the bloodstream or stored in muscle tissue as glycogen, ensures you have the stamina to power through workouts without hitting a wall. In fact, various professional fitness organizations recommend 50–60% of total daily calories should come from carbohydrates to produce optimal performance in athletes. On the other hand, low carbohydrate consumption can cause the body to use protein as energy, which in turn affects the ability of the muscle to repair and recover. Simply put, carbohydrates are king when it comes to exercise performance. Wildman, R., Kerksick, C., & Campbell, B. (2010). Carbohydrates, physical training, and sport performance. Strength & Conditioning Journal, 32(1), 21-29. Coyle, E. F. (1995). Substrate utilization during exercise in active people. The American journal of clinical nutrition, 61(4), 968S-979S. Koivisto, V. A., Karonen, S. L., & Nikkila, E. A. (1981). Carbohydrate ingestion before exercise: comparison of glucose, fructose, and sweet placebo. Journal of Applied Physiology, 51(4), 783-787. Neufer, P. D., Costill, D. L., Flynn, M. G., Kirwan, J. P., Mitchell, J. B., & Houmard, J. (1987). Improvements in exercise performance: effects of carbohydrate feedings and diet. Journal of applied physiology, 62(3), 983-988. Coggan, A. R., & Coyle, E. F. (1991). 1 Carbohydrate Ingestion During Prolonged Exercise: Effects on Metabolism and Performance. Exercise and sport sciences reviews, 19(1), 1-40. Coggan, A. R., & Coyle, E. F. (1987). Reversal of fatigue during prolonged exercise by carbohydrate infusion or ingestion. Journal of Applied Physiology, 63(6), 2388-2395. Sherman, W. M. (1987). Carbohydrate, muscle glycogen, and improved performance. The Physician and Sportsmedicine, 15(2), 157-164. Smith-Ryan, A., & Antonio, J. (Eds.). (2013). Sports Nutrition & Performance Enhancing Supplements. Linus Learning. This entry was posted in Tips and Advice, Supplements, Nutrition, Training. Bookmark the permalink.